Do you set New’s Year’s Resolutions? If so, how long do you remember your resolutions? I must admit, for me, they often fade out of sight and out of mind within a few weeks or months. How about you? Will you join me in this prayer for the new year? If so, I’ll meet you at the Throne. 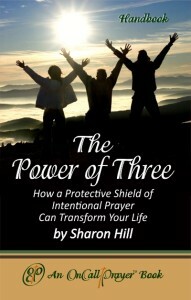 I’d like to share some excerpts from my book The Power of Three – How a Protective Shield of Intentional Prayer Can Transform Your Life – Handbook Edition available at oncallprayer.org, Amazon and Kindle. 2) Turn off or silence all electronic equipment i.e. phones, computers, televisions, radios, etc. 3) Do not read emails, or your social media sites until AFTER your quiet time. 4) When your mind wanders, have a note pad handy for a TO DO LIST. 5) When reading your prayer list, call the names out loud as you pray. (Refer to your OnCall Pocket Prayer Book©) An object, like a rock inscribed with a name, sitting by your coffee pot, is a great reminder. 6) Use the OnCall Prayer Journal© to hear from God . . . on paper. 7) Use different colors of markers and pens to mark important writings; use tabs to mark pages in your journal or Bible for future reference. 8) When reading scriptures read aloud and insert your name or the names of your loved ones in those scriptures. 9) Have photographs handy of people you pray for and/or post their photo on your phone wall-paper or computer desktop as a daily reminder. 10) Set phone alarms as prayer reminders especially for scheduled Conference Prayer Calls. 15) Keep in the mind the 3 Deadly D’s: Distraction, Discouragement and Doubt. 16) To release unforgiveness: Don’t curse it, don’t nurse it, don’t rehearse it, disperse it and God will reverse it. No prayer is ever prayed in vain! Begin praying by asking the Holy Spirit to open your heart and mind. If you are too busy to spend time with God you are too busy. It might be on your patio with a candle, soft music and possibly the sounds of a fountain. Perhaps it is in a favorite chair in your home or study with a delicious cup of coffee, or a park bench near your workplace where you can retreat during your lunch hour. Spending time with God will change your life! This could be weekly, monthly or for a specific event or need. There are several websites providing the conference calls services at no charge to include: freeconferencecall.com, totallyfreeconferencecalls.com and others. Set phone alarms (or other alarms) as reminders of time to pray for a specific prayer request or scheduled conference prayer calls. These calls may be set up at the same time weekly or monthly. Give an itemized list to each person who is participating in the prayer walk. A location ex-ample would be to pray quietly in and around a facility where a conference or event is taking place, or walk in pairs down the streets of a neighborhood to pray for salvation and blessings for those living in those homes. Churches often do this and leave behind a door hanger. It is powerful to look at the face of a person or loved one you are praying for and calling out their name to God in prayer. This is especially meaningful for the people who ask you to pray for them and their family members. One of the most important questions you can ask another person is “How can I pray for your today?” You may want to ask the waitress, grocery store clerk, fast food server, store clerk, and others. Use the OnCall Pocket Prayer Book© or a small notebook to record the names and prayer requests. Another suggestion is to write prayer re-quests on the Prayer List pages of your OnCall Prayer Journal© or in a notebook. 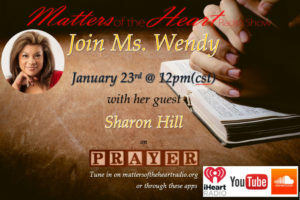 Periodically reflect back on those prayer requests and write in red ink how God has answered that prayer and the date. Text a short prayer to the person you are praying for. And if your Prayer Shield or Prayer Team is praying for you, text them the word “PRAY” during those specific times you need prayer. Have your assigned Prayer Shield members or prayer team on site to pray for you before you speak. They can pray over your notes, the empty chairs in the room and for those who will sit in those chairs, and for the sound equipment. It is very powerful for your prayer warriors to remain in the room praying quietly as you speak. Or your prayer team may want to pray on site in another room during the time you are speaking to a group. It is especially meaningful at churches to have a specific team of warriors pray for the pastor during the service. Fasting and Prayer ~ Why Fast? Fasting is not so much about food as it is about focus. Fasting and prayer is an outward response to an inward attitude and cry of the soul. Fasting is a spiritual discipline that is taught in the Bible. Fasting releases God’s supernatural power. (Matthew 6) The focus of fasting is to be in the Lord’s presence without disturbance so that you can hear from God. When you ask others to pray for you (especially in a serious or crisis situation) remember to get back with these intercessors to let them know the progress and/or how God has answered your prayer request. This is too often forgotten! This will encourage those who have been faithful to intercede on your behalf. 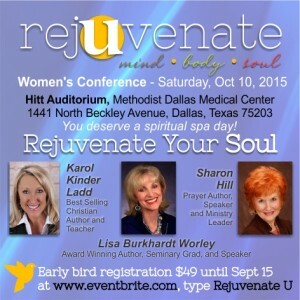 Ladies: You deserve a spiritual spa day. Join us October 10th 9:00-4:00 for the rejUvenate Women’s Conference. 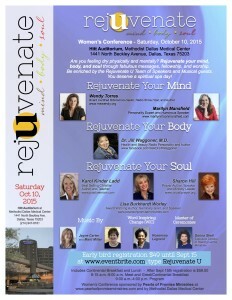 Register at www.eventbrite.com, type Rejuvenate U. 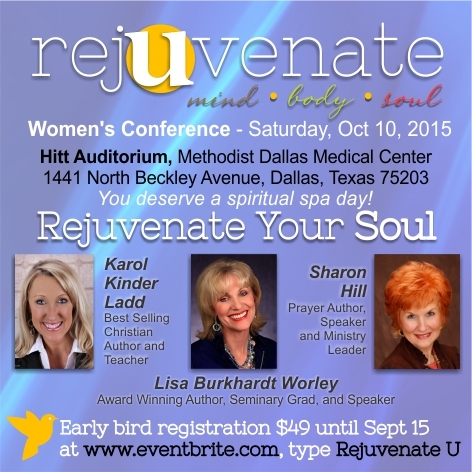 Early bird registration is only $49 until September 15. Includes continental breakfast (8:15-9:00am) lunch, and an amazing program! Click on flyers to enlarge for complete details or email me at SharonHill@OnCallPrayer.org. See you there! Learn how you can harness the power of prayer by forming a prayer shield of three warriors who are called to pray specifically for you. Intentionally covering your family, business, ministry and personal life with specific prayer is the key to sustaining and empowering your walk of faith. My passion is to teach others how to move from their own strength to God’s Strength through a purpose-filled and intentional lifestyle of prayer. Love the size of the Handbook. Visit the OnCall Prayer Book Store for details and pricing. Contact me for special pricing if ordered in quantities. I pray the reading of this small book will change your life!